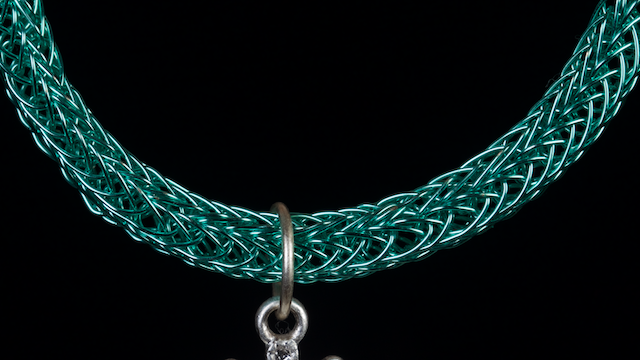 Also called “Viking Chain Netting” and “Viking Weaving”, this jewelry technique is done with neither knitting needles nor a loom, but instead with thin wire on a stick! This technique can be used to make necklaces, bracelets and earrings. The chain looks exquisite and complicated, but the process is simple and straightforward. This is a great portable handicraft you can do on the bus or plane, TSA has yet to take this away from me when boarding a flight! This class requires no previous crafting experience but it needs a bit of dexterity and is therefore best suited for middle-schoolers and up to adult. The materials and tools needed for this technique are, for the most part, available in your local craft and hardware store. They include wire, a wooden dowel, and general household items. The draw-plate used to finish this necklace is available at many craft stores, and certainly online, but you can make one yourself with only the most basic of wood-working skills, as mentioned in the class. To finish the project, you will need endcaps and closure findings available in craft stores or online. Wire snips, needle-nose pliers, and jewelry pliers are used as well. This DVD about Viking Knitting makes it seem as though you are attending a "One On One" class. The camera work makes it easy to follow the step by step instructions. Everything you need to know to complete a finished project is on this DVD. Clear instructions, easy to find materials, and lovely results! This class is definitely a good one. Our family has taken several classes taught by Marilyn Romatka. She is a very competent and approachable instructor. She has taught the most interesting classes at our homeschool co-op and viking knitting is one of our favorites! Her videos are really well done. Any beginner or advanced craft enthusiast can pick these techniques up with her clear instructions. Her videos are appropriate for all ages. We highly recommend her classes!